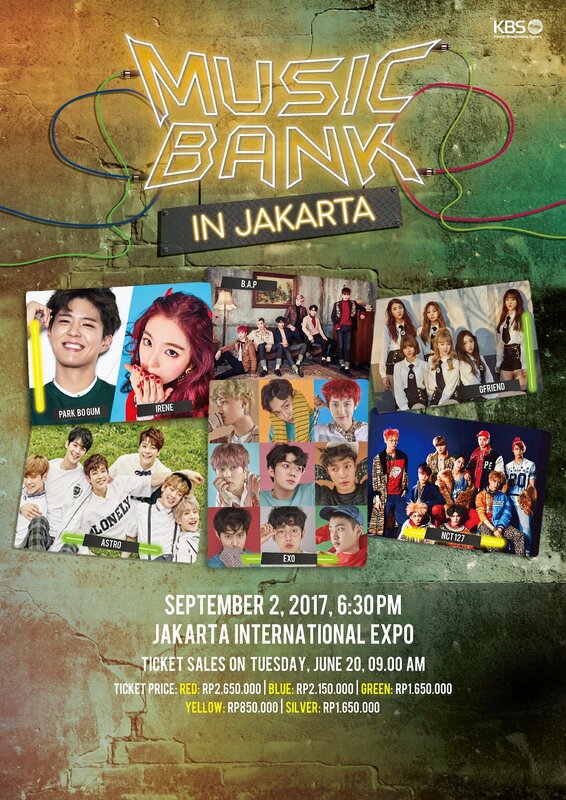 Four years after the festive of Music Bank in Jakarta 2013, the original music show from KBS came back with another star-studded line up to meet Indonesian Kpop fans. EXO, BAP, Astro, GFRIEND, and NCT 127 were announced earlier in the year as groups that will shine in the grand music show. The event didn’t start until 6.30 pm, but many people surrounded the venue since early in the morning as queue for wristband exchange started around then. The waiting felt strangely, but acceptably long due to the unusual heat of the day. Queue number method was applied rather slowly at first so a lot of people still presented near the start of the event, but then adjusted to a much faster method so many people could enter in shorter time. The stage was surprisingly low it felt amazing to see the artists up close when they first entered the stage along with cover dance performances of each artist’s song. ASTRO was first to come and ended with EXO and MCs of the night. The night was officially opened by the youngest group of all, NCT 127 and continued by ASTRO after special stage of K-Drama OSTs was performed. BAP’s vocals, Youngjae and Daehyun was the first to go on stage for cover of K-Will’s “Talk Love” from hit drama “Descendants of the Sun” and GFRIEND’s Yuju filled in Punch’s voice for a duet of “Goblin” OST “Stay With Me” with EXO’s Chanyeol. GFRIEND was the next to perform before special stages of Indonesia’s new boy group, B-FORCE, from audition show “The Next Boy/Girl Band”. The show continued with another special stages of GFRIEND’s Eunha and ASTRO’s Sanha & Cha Eunwoo covering popular Indonesian band, Mocca’s, songs “I Remember” and “Happy” before BAP took over the stage to sing their songs. Then, K-pop Juke Box happened where NCT 127 covered SHINee’s “Lucifer” & Super Junior’s “Sorry Sorry” and GFRIEND covered Seventeen’s “Pretty U”, BTS’ “I Need U”, and EXO’s “Growl”. EXO performed last bringing their hit and latest songs, but didn’t forget to add in extra surprise with special segment where they called one of lucky fans to join them on stage and took a photo with them. EXO was then joined by the other artists to close the night with a performance of DJ DOC’s “Run to You” while they bid good byes with fans attending. Music festival might not be for everyone because one thing stood out was some group’s fans dominated the others last night. Besides the sound which volume was lacking, the one that bothered the most yesterday didn’t come from the event, but the audiences who mostly failed to show basic respect for their non-favorites. Other already couldn’t hear what the MCs said because of the low volume, but the screams made it even worse. Overall, the show was another great time to enjoy K-pop as a general fan, but as an Indonesian we can hope for more collaboration with local artist and special stages for Indonesia in the future. Will quietly wish that we don’t need to wait for another 4 years for this to happen! Special thanks to Star Media Nusantara as official local promoter and Yes24 ENT Indonesia as official ticketing who also made this festival possible to happen!